Czech Republic is no land for dieters or vegetarians. Czech cuisine is renowned for being heavy. 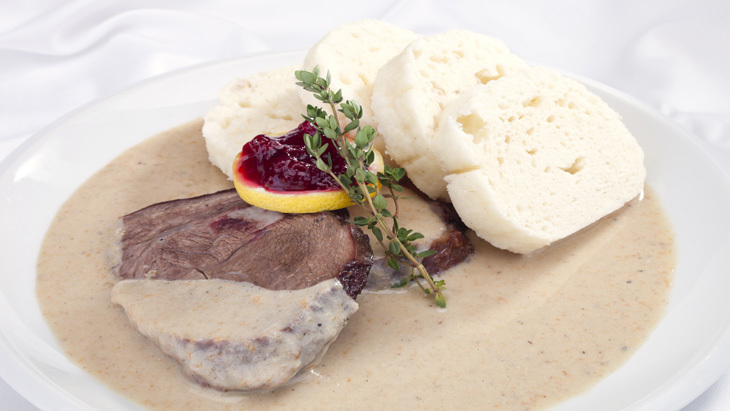 Many Czech dishes are meat-based, with thich, often creamy sauces most frequently served with dumplings. The pride of Czech cuisine is svíčková na smetaně. The dish translates into English as ‘Beef Sirloin with Cream Sauce’, the sirloin is marinated and then roasted with root vegetables and onions. The vegetables and the meat juice are pureed and cream and flour are added to the puree to make the sauce. The meat is then sliced and served with the sauce, bread dumplings, whipped cream and cranberry sauce. The name derives from the particular of cut of meat, the term refers to the sauce. When done well it is delicious and perfect as a hearty meal. Goulash (guláš in Czech) is another common Czech dish. It is basically large pieces of beef in a thick sauce, served with dumplings. Another typical Czech dish is Vepřo, knedlo, zelo - roast pork, dumplings, and sauerkraut. The name says it all. As to the sauces, most popular ones are rajská omáčka and koprová omáčka. The former is a smooth tomato sauce and served with a piece of beef. The latter, koprová omáčka - dill sauce - is a slightly sour sauce made from dill cooked in butter, cream, flour, and vinegar. Again, it is served with beef, dumplings or hard-boiled eggs. Last but not least out of Czech dishes is the vegetarian specialty smažený sýr - fried cheese, popularly known as smažák, or nakládaný hermelín (more of a pub food) - a brie-style soft cheese pickled in oil with spices, often served with a chili. The prices for a dinner range from one hundred crowns. As to the drinks Czech beer world famous. The Czech Republic is the No. 1 beer drinking nation on the planet, and no wonder when the beer tastes terrific and is cheaper than water. It is served everywhere is Prague, even in breakfast cafés. Try some of the popular Czech beers such as Pilsner Urquell, the original Pils beer from which all golden beers are derived. Recently, beer from smaller breweries have become popular. Check out the Únětický Pivovar brewery, located just north of Prague.